There’s not been much “movement at the station” since VH-CAT arrived. Our first problem was with Quarantine who didn’t want us to touch the aircraft until they had made a final inspection. The Quarantine people in Darwin allowed the CAT to enter Australia on the understanding we grounded it at Bankstown for a more thorough inspection. Unfortunately this took several weeks. Now we are trying to find a supervisor/s that would be available to supervise the volunteers who have graciously offered their time and services (refer to the February newsletter for details). As reported last month, because of the Victorian Bushfires we have decided to leave the fire bombing tank and equipment in situ, particularly if the National Aerial Fire Fighting Centre will assist us with a grant. We may never be called upon to fight fires but would be on standby without affecting the historical purpose of the aircraft and its hangar/museum. By leaving the water tank and scooper in, it will also allow us to do less work on the aircraft to get its Australian C of A. This equipment can be removed at any time at leisure but will allow the aircraft to get back in the air more quickly. The new engines are being run every few weeks to keep them in good shape but are due for a regular 100 hourly. For this we are looking for an inexpensive Grade 1 engineer approved on 1830-92 engines. To obtain an Australian C of A we are required to conduct a thorough inspection from head to tail, both inside an out. Worn or corroded parts have to be replaced so the aircraft is better than new. All this must be then signed out by an engineer qualified on this type before the CASA delegate can issue the certificate. Some of these experts will need to be paid! Unfortunately our financial condition is hindering our speed of operation and the current economical “downturn” is not helping. We are hesitating to incur more expenses when we still owe money to others, so our appeal for help continues. In particular, a corporate sponsor absolutely necessary to help ensure the viability of the project. A corporate sponsor would benefit greatly from the unique flying/splashing/floating advertising billboard VH-CAT would provide. Much P.R. would be gained because the Cat is so photogenic when touching down on the water. We can guarantee maximum exposure on TV and Radio. Ideas and introduction sought! Don’t forget donations of $2 or more are tax deductible – and we are offering adventure flights to members in advance on contributions of $2,000. PBY 7(A) – could it be? What PBY (version) would it be based on? Would it have more firepower and where? Would it have 2 or 4 engines P&W's or Cyclones? Some of the responses were most interesting, some even suggesting (at least to me, anyway) the consumption of some very dubious substances! Anyway, it is most entertaining and well worth having a look at if you happen to be poking around for some good, light-hearted PBY fun. So on that weird and wonderful note, I’ll leave you all now and report next month if there are any developments on the VH-CAT front. 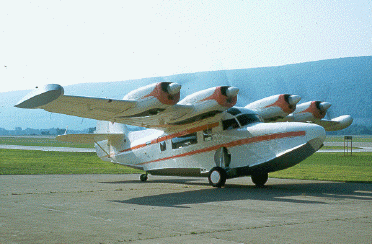 PBY 7(A) - Could it be? A $1000 donation will get you a seat as a crew member on a flight. $5000 will get you a number of flights including water landings and some instruction. This reward will be available some time in the future once the Catalina is established in Australia.